All your common makeup myths busted. Myth #1: Primers are not required if you’ve moisturized your skin and applied your foundation evenly. Fact: This is so not true! I personally feel that anyone can rock a red lipstick; you just need to find the right red that suits your skin tone. Reds with a blue undertone tend to be universally flattering. When choosing a red lipstick (learn how to apply), it’s very important to try the color on your lips (of course after they are sanitized) and never go by how the color looks in the bullet. There are tons of brands out there that make red lipsticks (find the one for your skin tone), you are guaranteed to find your perfect shade, you just need to have some patience and keep the hunt going. Myth #3: Match your foundation to your forehead, cheek, neck or hand. Fact: I feel finding the perfect foundation (this is how you apply foundation) color is the toughest task when it comes to makeup products, especially if you don’t know what color you’re supposed to match it to. If you place your hand besides your face in front of a mirror, you will notice that your hand is a tad bit darker than your face. That’s because your hands get exposed to a lot more UV light and a lot less exfoliation than your face. Also due to stress, weather conditions and sun exposure, the skin on your face will be a different color than the rest of your body. Always test stripes of foundation on the jawline in natural light. 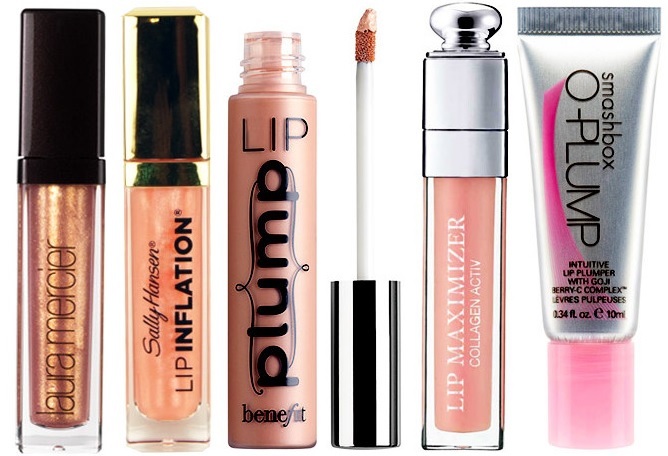 Myth #4: Lip plumpers can change the size of your lips. Fact: Lip plumpers contain ingredients like cinnamon, menthol, hot pepper and caffeine which stimulate blood flow by irritating the lips, causing for a swollen look. The effect wears off soon. The only permanent lip plumping solution is by getting lip augmentation with ‘hyaluronic acid fillers’. Myth #5: Keep pumping your mascara wand in the tube to get rid of clumps. Fact: Each time you pump the mascara wand, you are only pumping air into the tube, making the formula dry out faster and making it a breeding ground for germs. No matter what mascara you use (read when you should get rid of your mascara), pigment eventually will start to cling to the brush. The best way to get rid of clumps would be to rotate the wand inside the tube and then wiping down the wand with a tissue before application. Myth #6: You can’t wear eye shadow that matches your eye color. Fact: People will say many things. But it’s upto you weather you follow or go the other way. Contrasting colors do make your eyes pop, but that doesn’t mean brown eyes can’t wear brown eye shadow. In fact, sometimes matching hues make a very bold statement. Myth #7: Concealer should be lighter than foundation. Fact: I can’t even begin to tell you how many times women have thrown around this statement in front of me. Everyone has different skin tones and some women might need lesser or more coverage than the other. In reality, you should match your concealer as close as possible with your foundation. 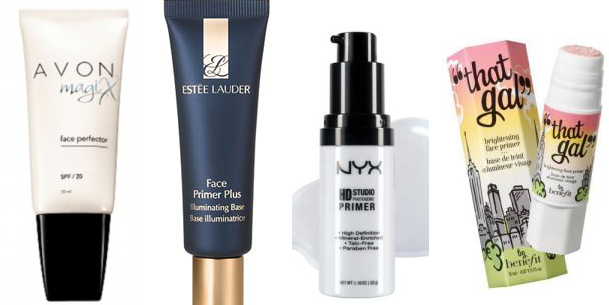 Lighter concealers will just make your flaws stand out – that is so not the aim! Myth #8: Pick a foundation that’s lighter than your skin. Fact: Whaaaat?? Whhhyyy?? Most of us Indians are born brown. 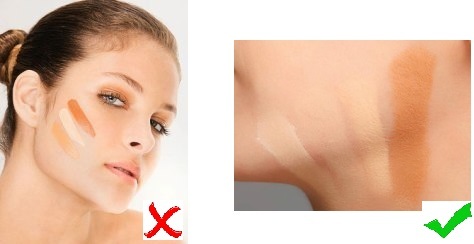 But woman in general prefer picking up foundation shades that are lighter than their skin tone. Have you ever noticed at a party, the lady’s face in front of you has turned grey and ashy? Well, that’s because she’s wearing a much lighter foundation that she should be wearing. So how do you pick the right shade? Test the foundation on your jaw line. If it disappears it’s the right shade. If you have to struggle to blend it in, it’s the wrong color. Easy no? Myth #9: Makeup causes acne. Fact: There is no research indicating that makeup causes acne. Makeup gets the bad name but a lot of the times acne is caused due to poor hygiene. Going to sleep with makeup on, not cleaning brushes often enough and using products past their expiry date will cause your skin to break out. When trying a new product, women may experience breakouts. These can be the result of an irritant or a result of some new ingredients not matching the person’s skin type. That means you have to experiment to see what might be causing your breakouts. Myth #10: It’s perfectly fine if your makeup products tingle skin. Fact: Isn’t it common sense that if something tingles or feels cold on the skin, something’s not right? The sensation you feel is your skin telling you it is being irritated. Products that produce that sensation (menthol, cinnamon etc) can actually damage your skin’s healing process (the ability of a wound to heal normally), cause collagen to break down (vital for skin elasticity), and increase the growth of bacteria that cause pimples. Your skin may not show it initially, but if you apply irritants to your skin regularly, the damage is still being done gradually. It’s not my dream to look fair – I like a tan! Different tastes in different countries.